I drew this portrait of a friend and her dog, I usually don't like to do portraits because they are a bit of a challenge for me, but I felt in the mood to try it...maybe the glass of Irish cream I was drinking made me a little braver :) I used Prismacolored pencil and it measures 8" x 10". Everyone needs a little BLING in their life! 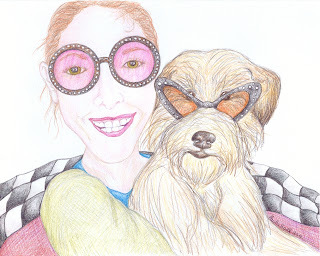 Wow you are a master at your craft...and this darling doggie with the glasses has great attitude don't you think?! oh my, great portrait. fantastic glasses!!! You added as little bling to my morning! Thanx! I love this picture! It's funny and colorful. Great expresions in mom and dog and the checkervoard background gives some action! Thank You everyone for your kind words about this drawing, motivates me to do more.